The agile requirements management tool that Business Analysts love. Get started in minutes. CaseComplete is unlike any requirements tool you've seen. Here are five reasons you should give it a try: You can be up and running in minutes. It's more consistent and repeatable than using Word, Excel, and Visio. An intuitive interface shows you how to specify all kinds of requirements. Easily add test cases to your requirements and use cases. Automatically generate documents that will make you look great. Start your free trial today. Capture software requirements and use cases with less effort. 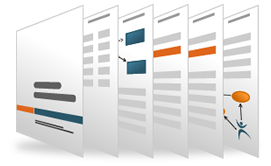 Generate requirements documents automatically.